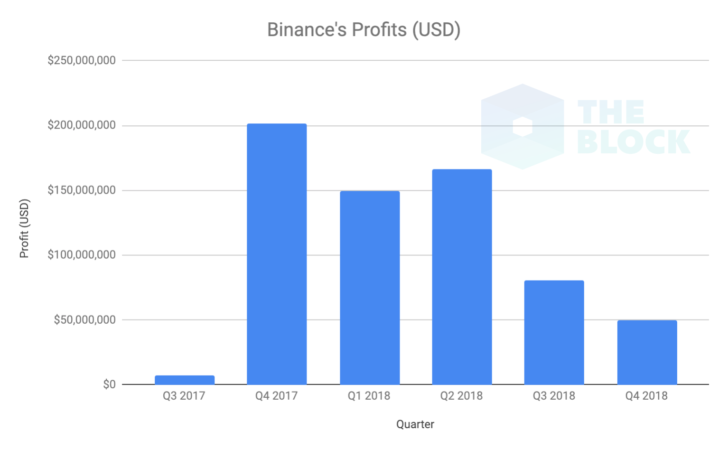 According to an exclusive piece compiled by The Block, Binance, one of the world’s most well-known crypto upstarts, continued to post impressive profits, even as Bitcoin (BTC) lost over 70% of its value in fiscal 2018. Per the Malta-based exchange’s finances, deduced and procured through publicly-available statics regarding Binance’s quarterly BNB burns/supply reductions, a profit of $446 million was raked in. While this wasn’t impressive as the $201 million that the company pulled in Q4 of 2017 — when BTC found itself above five-digits in a jaw-dropping turn of events — it goes without saying that this simple statistic should have investors shocked. While $446 million in profits is impressive for any fintech unicorn, especially for one just launched in mid-2017 and not backed by venture funding, the company’s profits have been on a downtrend starting from Q2 of 2018. Case in point, Binance, headed by industry golden child Changpeng “CZ” Zhao, secured $166 million in from April to June, and then $80.9 million in Q3, then $49.6 in the waning months of yesteryear. Regardless, many would argue that the company is doing fine for itself. In August, Dovey Wan, a crypto-friendly partner at Primitive Ventures, remarked that Binance actually outperformed Deutsche Bank in Q1, with a fraction of the European giant’s employees. She explained that this fact, which some dubbed “apples to oranges,” doesn’t only accentuate Binance’s strong performance, but the “disruptive potential” of Bitcoin and other crypto assets too. More materially, the company has continued to expand its offerings. In recent weeks and months, Binance relaunched its, well, Launchpad, introduced integration with credit/debit payment processor Simplex, started an over-the-counter trading desk, along with an array of fiat-to-crypto exchanges that should have investors buzzing. 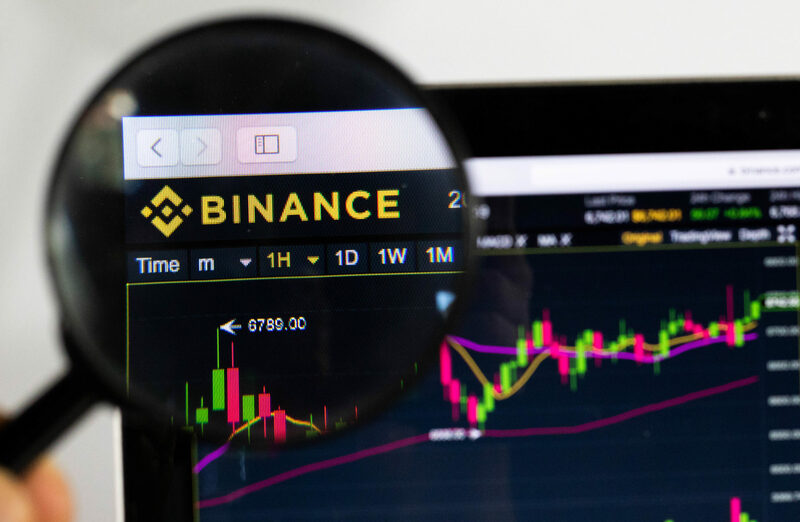 News regarding Binance’s financial situation comes as a number of crypto upstarts, including many notable names, have claimed that a bear market-induced pressure sparked dramatic changes internally. Look at Bitmain, for example. Rumors from inside sources suggest that not only did the company layoff a mass of the ~2,000 employees in its non-ASIC manufacturing arms, but Bitmain purportedly lost the leadership of Jihan Wu too. More recently, ShapeShift, the company behind the exchange that shares its name, CoinCap, and KeepKey, laid off 37 employees — one-third of its staffers — in an evident bid to extend the potency of its war chest. Blockfolio, BlockEx, Steemit, SpankChain, and ETCDEV are among other notable industry participants to have either folded or laid off employees to extend their financial runway. Little is known about Binance’s operations. But considering the company’s staggering profits, it would be fair to assume that it’s doing all ‘fine and dandy’, as it were. While arguably even less is known about San Francisco-headquartered Coinbase’s operations, some believe that the company evidently outperformed the so-called “nuclear winter” too. In Q4 alone, the company secured $300 million $300 million in funding from Tiger Global, Y Combinator, A16Z, Polychain Cap, and a number of other crypto-friendly venture groups. This round valued Coinbase at a jaw-dropping $8 billion, making the firm the most valuable company in the entirety of the Bitcoin ecosystem. And since that $300 million cash boost, which was explained to be allocated towards global expansion efforts, institutional services, and applications for crypto, Coinbase has arguably been on the up-and-up. Coinbase launched a number of pertinent products, including support for Circle-backed USD Coin, a revamped version of Earn, PayPal withdrawals, and crypto-to-crypto trading, to only name a few products. The firm also added a dozen crypto assets to its platform, an evident sign of changing times, with notable additions including ZCash (ZEC), Basic Attention Token (BAT), Maker (MKR), and 0x (ZRX). According to the 2019 installment of Forbes Fintech 50 — industry onlookers and participants should also keep an eye out for Ripple, Axoni, Gemini, and Circle, as the prominent outlet believes that the aforementioned firms will make strides, even if the broader blockchain space continues to wheeze. How can you just go on and compare binance to coinbase?! It’s outrageous. Coinbase is a major scambase while binance is just a legit echange! What’s important here is that coinbase were boasting about it in 2018 already. Beautiful. Binance is a decent platform with decent people working there. While coinbase is just a promotion f***. Well of course binance did. Look how fun they make everything. They are trying very hard to engage users in some action, to make them think. And coinbase has enormous fees and that’s it. Coinbase only outperformed with the help of their enormous fees. That’s it.